Reverse Side Customization - only $5 more! You don't have to be a smoker to love these quality wind-proof, refillable, zippo-style lighters. They're perfect for keeping in the car, the tackle or tool box, for lighting special candles, or cozy fires! 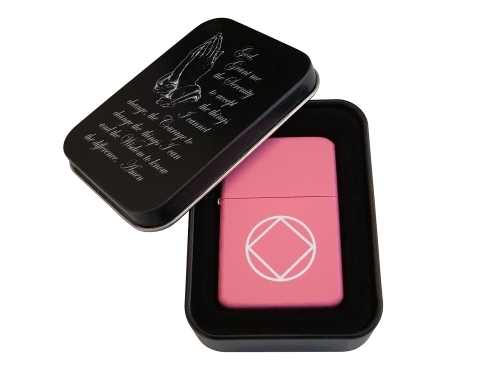 This beautiful matte pink lighter features our familiar Circle and Diamond NA Service Symbol on one side of the lighter. 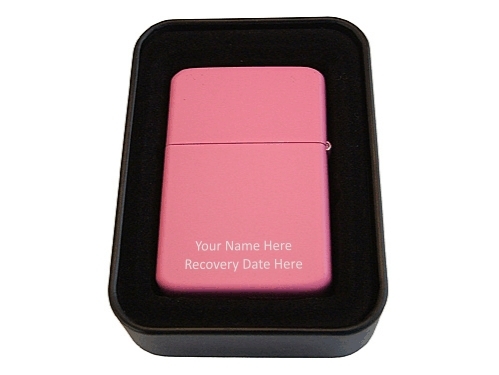 You may optionally laser engrave the opposite side with a name, recovery date, or other special message. Each lighter comes in an attractive gift tin which is beautifully engraved with our beloved Serenity Prayer. These gift boxes are perfect for keeping special keepsakes and small treasures! Or, use the tin as a God Box!